It’s nice when the birds come to visit. During our eleven years of living in New Mexico I encouraged them with feeders, and attracted 120 species. Back then I set up my spotting scope inside the house and photographed the birds by focusing a little 2 megapixel point-and-shoot camera through the scope’s eyepiece. My New Mexico yard list and photos may be seen at this link. However, I never got around to explaining our motive for relocating from a mile and a half high in the mountains to a hot and muggy lakeside plot. I still plan to address this, but it is a story in itself, as is, indeed, our decision to occupy a second residence. 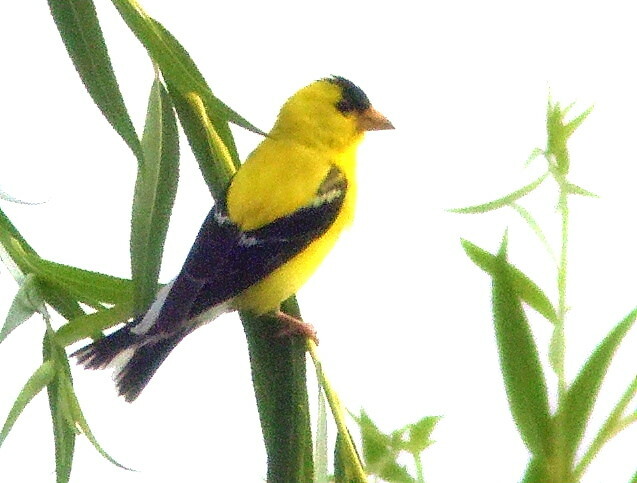 Now that Mary Lou and I have homes in both Florida and Illinois, I have collected photos of quite a few yard birds that I have photographed, many from inside or from porch and patio. 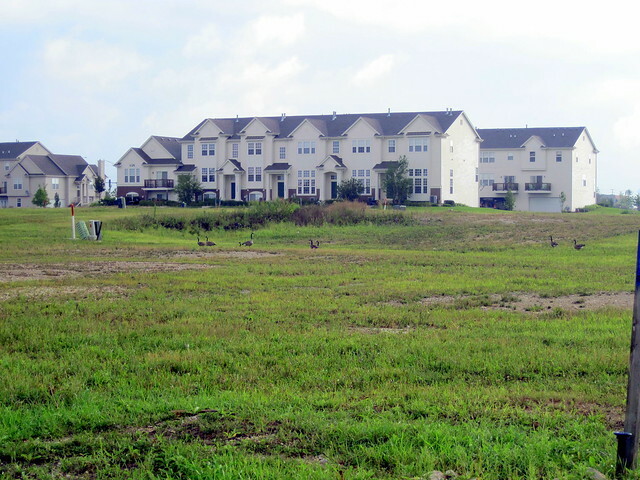 In Illinois, our “yard” includes about a city block of disturbed land that was fitted out with utilities and fire hydrants and then abandoned. It was to be packed with more townhouse style condominiums, but not long after we moved in about four years ago, our builder’s plans were terminated by the burst of the housing bubble. 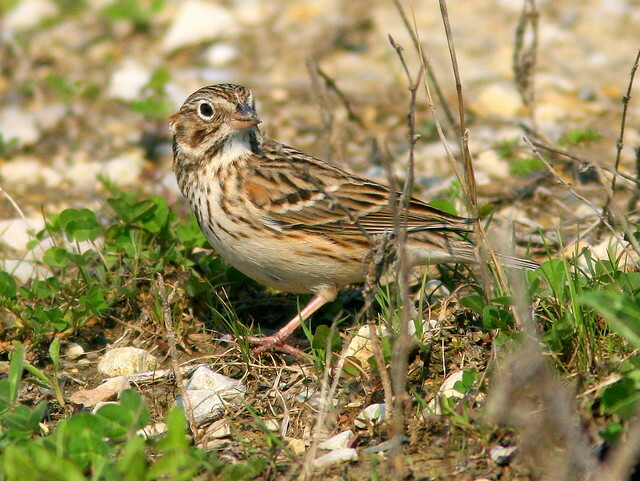 The area, formerly a cornfield, quickly reverted to a weedy grassland and now attracts breeding sparrows, Red-winged Blackbirds, Meadowlarks, Horned Larks, Killdeers and Spotted Sandpipers. 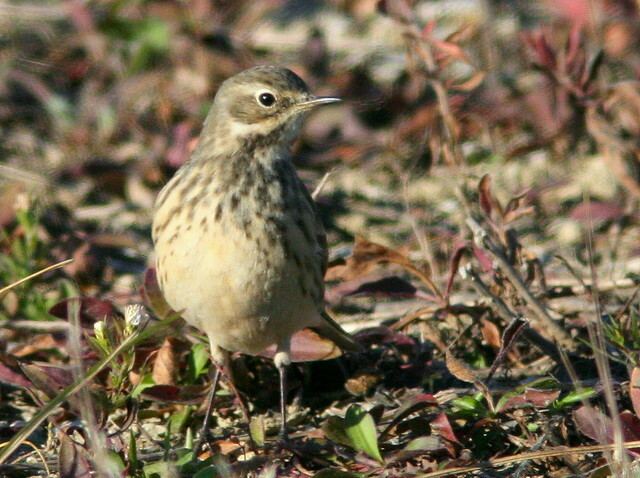 Pipits and longspurs have visited during the winter, and migrating geese and Sandhill Cranes often stop by. 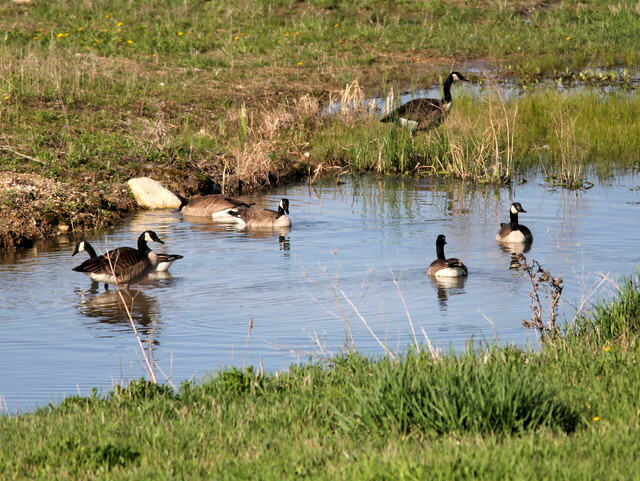 Spring rains cause temporary puddles (local birders call them “floodles) where ducks sometimes visit. Raptors hunt for prey. The builder erected wooden posts to mark the various utility lines. Waste broken slabs of concrete and rocks were left in piles along the road. 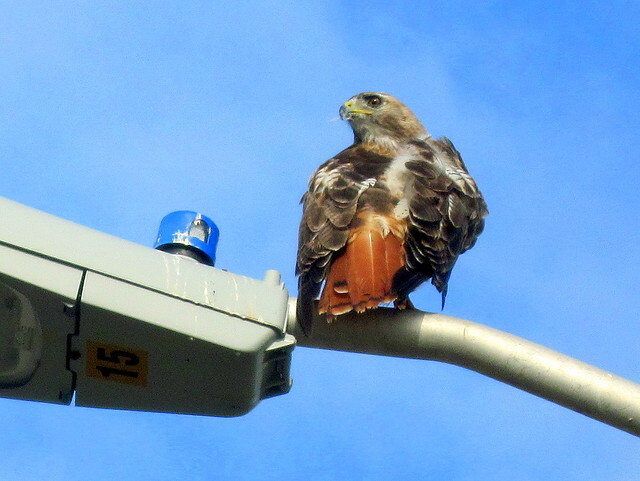 Lacking any other elevated vantage points, birds like to rest on them. 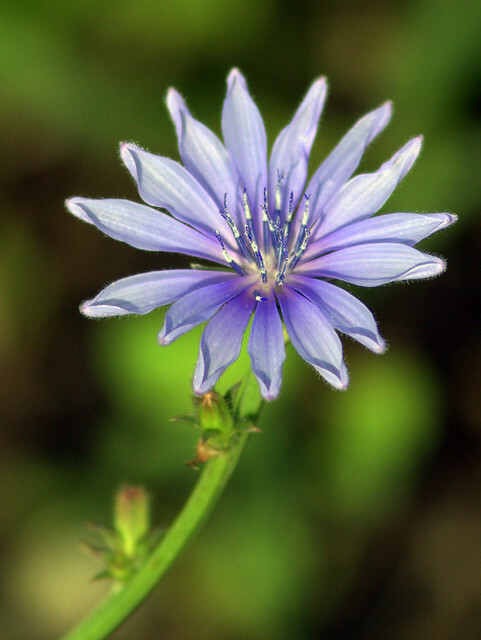 I can simply focus on one of them and, if patient, sometimes be rewarded with nice photos. 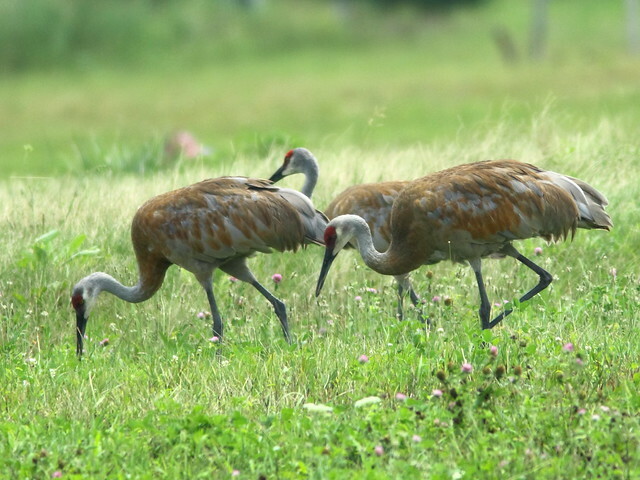 Now it is almost time for us to return to Florida, and this is a retrospective look at a few of our Illinois yard birds. August 30th, 2011 at 9:20 am My favorite was the “American Kestrel flies up for a landing…” Besides the fact that I have never seen one, it was beautiful in flight! 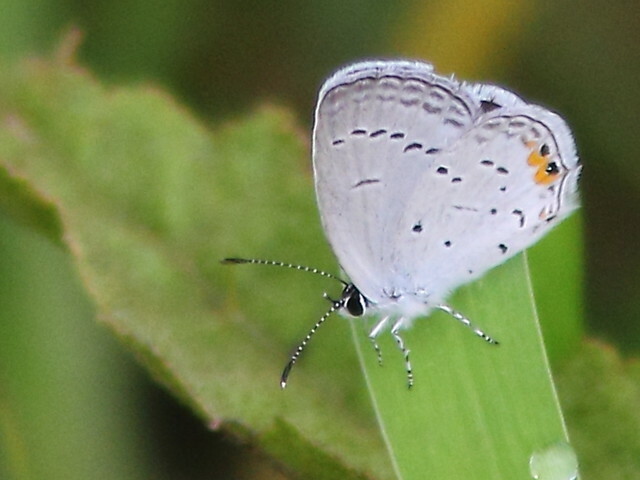 Also, the Eastern Blue-Tailed Butterfly was very interesting. I don’t think you meant to focus on it’s legs and antenna, but it inspired me to look up more about butterfly body parts. “The butterfly’s body can be divided into three segments or parts. The head contains the eyes, the proboscis, and the antenna. The butterfly’s proboscis can be called a tongue. 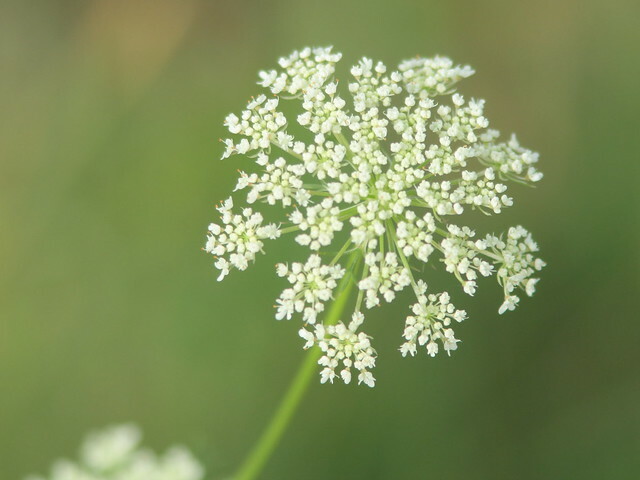 The butterfly uncoils or unrolls it’s proboscis and then uses it to drink nectar from plants or other nutrients. Sometimes they drink out of water puddles. A butterfly uses it’s antenna as a nose. They sniff the air around them using their antenna. A butterfly’s antenna is shaped like a club while a moth’s antenna is feathery.” from http://library.thinkquest.org/J002124/parts.htm Thanks again for your great blog and photos. August 30th, 2011 at 10:25 pm That’s a beautiful series of birds. 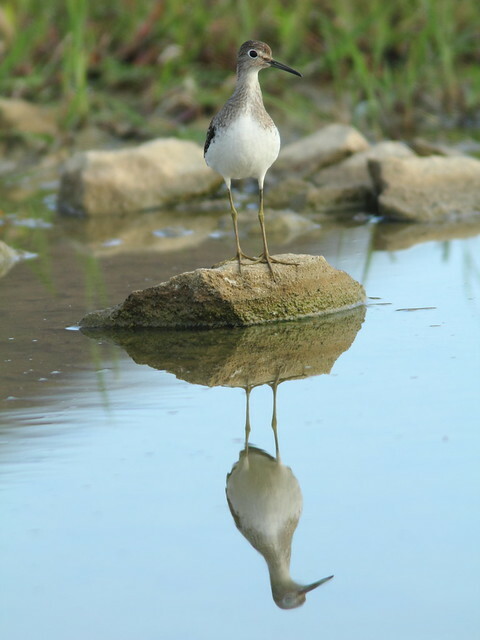 My favorite would be the Sandpiper and the perfect reflection. I am always surprised that so many birds can re-colonize the waste places humans make! August 31st, 2011 at 1:45 am Wonderful post!! So many birds you spotted, both small and large, amazing! 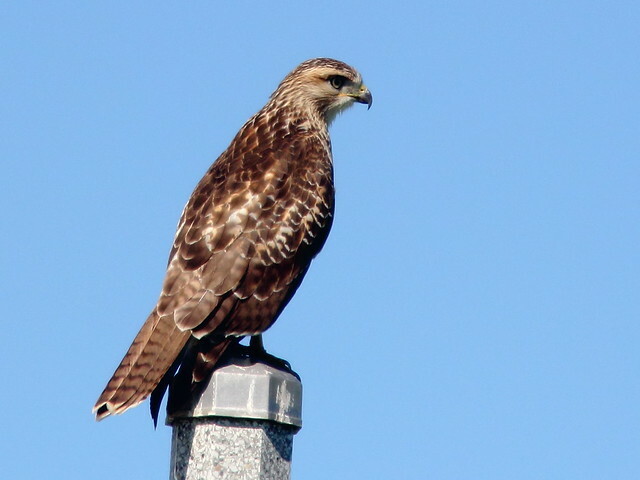 August 31st, 2011 at 3:28 am What a superb post with so many beautiful birds. 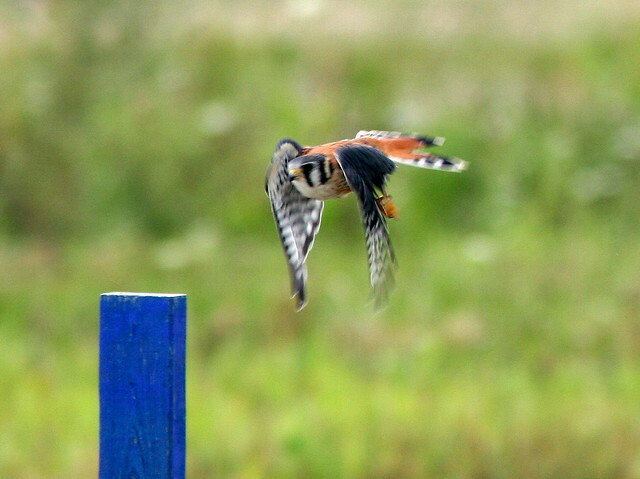 I had never seen an American Kestrel before and am so glad you showed me this beautiful and colourful bird. 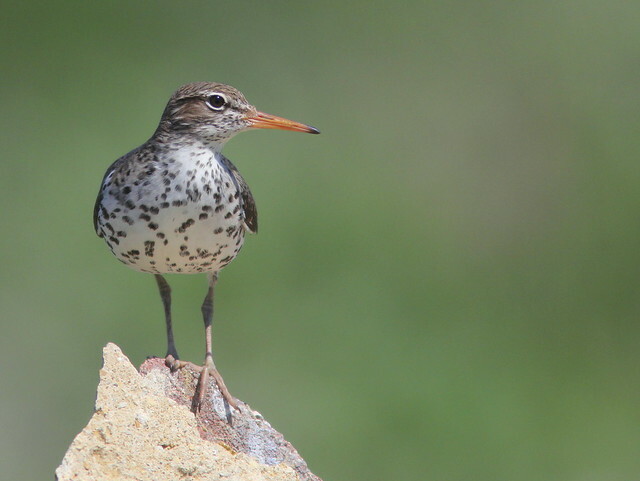 The spotted sandpiper hit the spot with me as well, he looked so like a bird’s egg with his rounded chest. I thoroughly enjoyed your photographic skills. August 31st, 2011 at 7:31 am Wonderfulf post!! Boom & Gary of the Vermilon River, Canada. 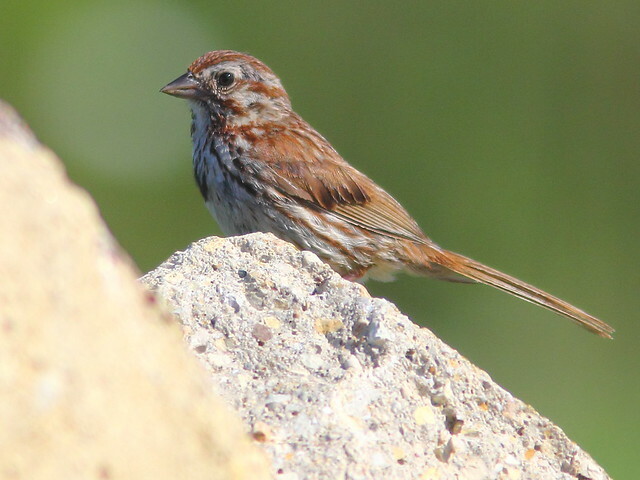 August 31st, 2011 at 12:51 pm Wow you have some beautiful wildlife on youe patch… thanks for sharing your lovely images. August 31st, 2011 at 6:29 pm Wow, these are all awesome birds. The kestrel is just beautiful. 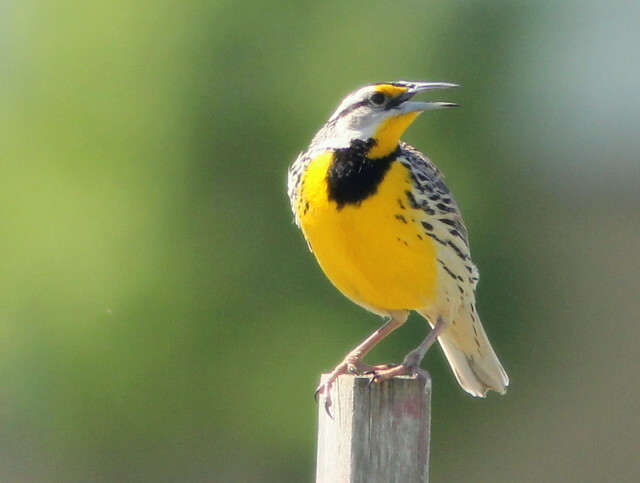 And I love the meadowlark and horned larks. Great photos, well done! 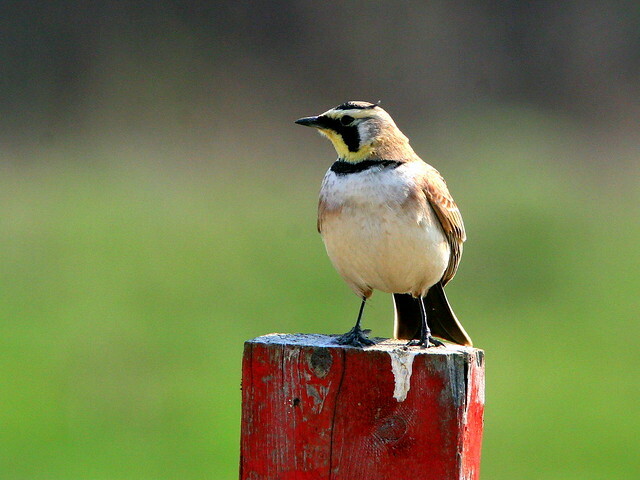 August 31st, 2011 at 6:49 pm That horned lark is amazing! August 31st, 2011 at 8:51 pm Wonderful post! 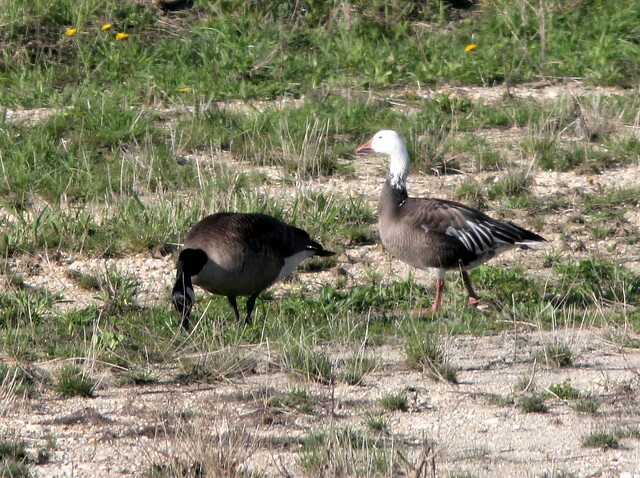 To have a Snow goose on your yard list is pretty special. 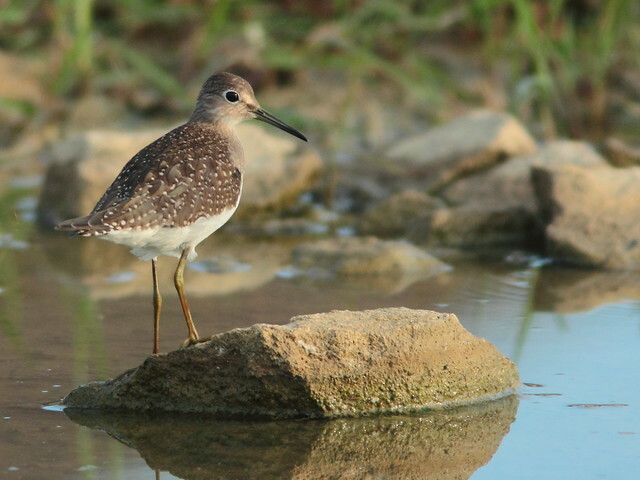 I’ve got to tell you though, even with your great hawk photos, the Spotted sandpiper picture is a classic. A perfect picture I’d say. 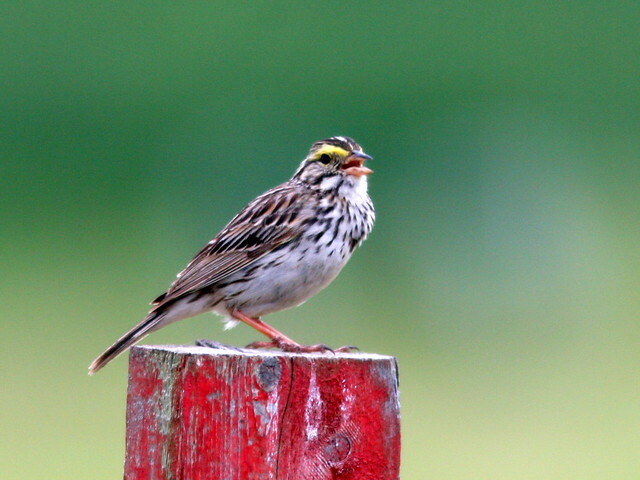 The backlighted Meadowlark is awesome too. Great stuff as always, wonderful to see! September 1st, 2011 at 3:49 pm Thanks, all!! @Springman: I just happened to look out and saw the white head of that Snow Goose. Only there once. Yet, I probably don’t spend more than 30 seconds a day looking out of my upstairs bedroom window. How lucky can I get– or, more likely, how many other wondrous sights do I miss? Birding is a game of probability. You’re lucky to be there when the rare bird appears. It follows that the more time you spend looking, the greater your chance at hitting the lottery. If you don’t buy a ticket you just can’t win! September 1st, 2011 at 4:10 pm @ Mick: Yes, it surprised me that the birds not only began nesting there but continued to do so despite the disturbances from dog walkers and even twice annual grass mowing– the first after the Horned Larks had already begun nesting in early May. September 1st, 2011 at 6:34 pm I am amazed at the variety of wildlife found in your “yard” - I have many favorites here! Lovely captures! September 3rd, 2011 at 10:21 am Great series!! !